When a presidential candidate turns up dead in a dinner one night, the spotlight turns to his family and the people present during the incident. In the search for truth, motives are questioned and secrets are exposed. Prima Facie, a production of Artistang Artlets, the Official Theater Guild of the Faculty of Arts and Letters of the University of Santo Tomas, attempts uncover this mystery. 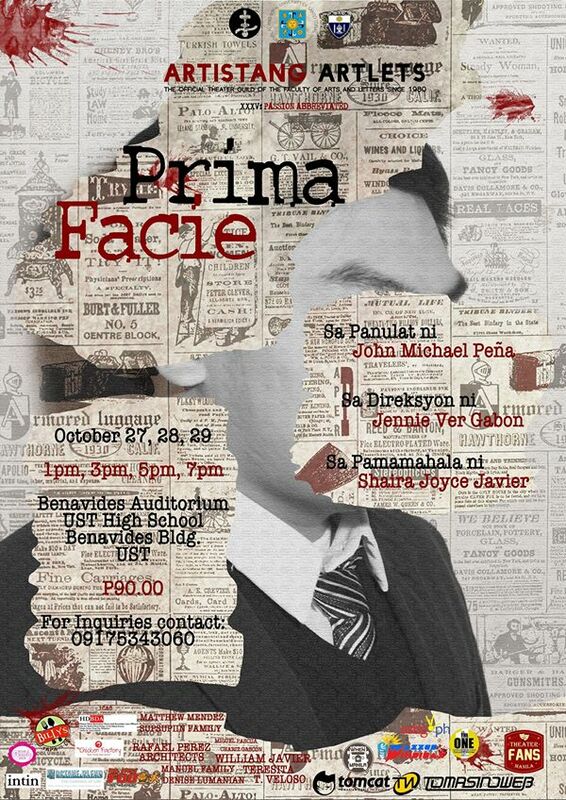 Prima Facie is written by John Michael Peña, directed by Jennie Ver Gabon and produced by Shaira Joyce Javier. It will be staged on October 27, 28, and 29 (1PM, 3PM, 5PM, and 7PM) at the Benavides Auditorium, UST High School Building, University of Santo Tomas. For inquiries, contact Ma.Diane Gundaya (09279381150), Xiayra Mae Magtibay (09175977812) or John Gabriel Pe (09225383521). You may also visit the Artistang Artlets Official Facebook page.